The Biosafety Risk Management Program is to maintain biosafety within laboratories. Since 2014, given the occurrence of Ebola virus and other infectious organisms, the safety of laboratory staff and other personnel attracted much attention and concern. The laboratory measures that had been very effective until this time were deemed to be insufficient for handling very infectious and lethal organisms, such as hemorrhagic fevers, that could spread across populations. Over this time, a number of safety incidents were reported in the U.S. that involved the handling of biological agents and toxins in laboratories. As a result, Federal and State agencies worked to develop more robust safety and security systems with a focus on how samples that could contain highly infectious agents are received and handled by laboratories. The goal was to significantly reduce or eliminate any possibility of personnel being exposed to an infectious agent. In the latter part of 2015, the federal government awarded funds to state public health laboratories across the U.S. via the Epidemiology & Laboratory Capacity (ELC) grant to create the position of Biosafety-Biosecurity Officer. The Association of Public Health Laboratories (APHL) has and continues to provide technical and management training to all Biosafety-Biosecurity Officers. In Delaware, this position covers a number of essential responsibilities – i.e., performance of biosafety risk assessments and help with the development or update of a biosafety management program within the Delaware Public Health Laboratory and all clinical and environmental laboratories in Delaware. To date, seven sentinel hospital laboratories, one other State agency laboratory and the Delaware Public Health Laboratory have completed their initial assessment. All of these laboratories face the possibility of receiving specimens that may harbor highly "infectious" agents, such as Ebola virus, Bacillus anthracis and highly infectious influenza virus. For this reason, detailed audits were performed, which focused on minimizing or eliminating exposure risks for laboratory staff. Once risks were identified, risk mitigation strategies and recommendations were provided to the laboratory administrators and section managers. The initial series of risk assessments were completed for all of Delaware’s clinical sentinel laboratories by March of 2018. 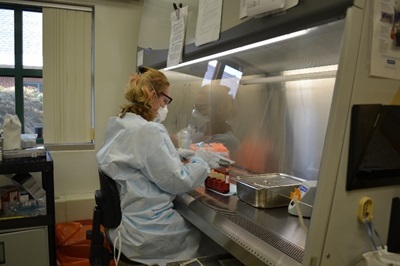 DPHL Biosafety Official continues to provide assistance through distribution of reference material, on-site visits and training in the area of biosafety to help support the sentinel laboratories. Areas of interest include standard operating procedures, follow-up risk assessments, biosafety manual review and procedures for staff and administration to follow in the event of an unexpected exposure. The DPHL Biosafety Official is available to provide guidance and/or resources to further the development of all laboratory Biosafety Managements Programs. To learn more or schedule an assessment please contact Delaware Public Health Laboratory. APHL's "Clinical Laboratory Biosafety Risk Management Program Assessment Checklist"